GECON 2018 builds upon the very successful tradition of the conference previous editions since 2003, (http://www.gecon-conference.org). GECON solicits contributions that are interdisciplinary, combining business and economic aspects with engineering and computer science related themes. Contributions to this conference can include extensions to existing technologies, successful deployments of technologies, economic analyses, analyses of technology adoptions, and theoretical models. 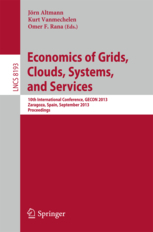 We welcome papers that combine micro- and macro-economic principles with resource management strategies in computer science and engineering. Case studies, which demonstrate practical use of economic strategies, benefits and limitations, are particularly encouraged. The purpose of this event is to gather original work and build a strong multidisciplinary community in this increasingly important area of a future information and knowledge economy. Upon request from several authors, we are extending the deadlines for submitting abstracts and full contributions. Cross-technology, self-managing mechanisms, tooling to increase productivity in Platform-as-a Service environments. Extended versions of up to 10 accepted papers in the Computer Science field will be invited for publication in a special issue of the Elsevier Journal of Future Generation Computer Systems. For papers targeting mainly business and economic aspects within the conference, a special issue of the Springer Electronic Markets Journal with up to 5 papers is foreseen. Visit the submission page for more information on the publication and reviewing process. April 2018: Two Special Sessions on IT Service Ecosystems and on Artificial Intelligence will run at GECON 2018. February 2018: Call for paper is being distributed.